What or Who is HBE? HBE are seven brothers from the south side of Chicago. These blood brothers, seven sons of jazz great Phil Cohran, carry on his musical legacy. Together they have toured throughout Europe, Asia, Australia, Africa and South America playing with everyone from Prince, Mos Def, Mick Jones (The Clash) and Damon Albarn (Blur, Gorillaz). They’ve performed Coachella, WOMAD AU, Jazz at Lincoln Center, The Sydney Opera House and Carnegie Hall. The documentary film Brothers Hypnotic, explores their music, work ethic, life and experience of being raised by their jazz legend father Phil Cohran. After screening in major cities and festivals, it aired on PBS. Their song, “War” was featured in the blockbuster hit movie, Hunger Games. Now celebrating 10 years of touring internationally as independent artists, the band quietly released “Sound, Rhythm and Form” in 2016 as a special treat for their loyal fans. Hypnotic Brass Ensemble continues to create and record and are currently working on the forthcoming “Bad Boys of Jazz” LP. 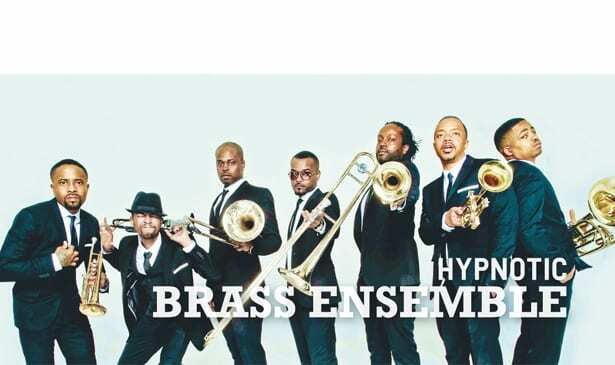 For more information about Hypotic Brass Ensemble, visit https://www.hypnoticbrassensemble.com, or follow Hypnotic Brass Ensemble online at Facebook and Twitter.